It was noted that Councillor Round was substituting for Councillor Mrs Ring. There were no urgent items.� However, due to an emergency situation in the town centre the Chairman had agreed to take the report of the Head of Housing and Community Services related to the Housing Allocations Scheme Review before the Work Programme agenda item in order that the Officer could assist with the incident. RESOLVED:� That all items on the agenda be taken in public. RESOLVED:� That the minutes of the meeting held on 20 June 2017 be approved as a correct record and signed. The Head of Housing and Community Services presented a report on the Housing Allocations Scheme Review and Update. The Committee noted that amendments to the scheme were being proposed ahead of the Homelessness Reduction Act that was planned to be introduced next year.� The framework set out how priority was given to those who join the Housing Register. The Head of Housing and Community Services detailed the amendments to be made as set out in Appendix I to the report. � That the number of those families that had previous or current rent arrears equivalent to a minimum of 8 weeks rent were not common but did cause difficulties in nominating to housing providers. � The number of exceptional circumstances that occurred where the Head of Housing and Community Services has had to use his discretion to accept an application that does not meet any of the Housing Need criteria had been very rare. � Allowing an applicant access to the Housing Register when they are threatened with homelessness at 56 days should not cause difficulties in relation to the regulations related to preventing retaliatory evictions. � The sum of �16,000 of capital, investments and savings constitutes having sufficient funds to rent privately or buy a property would include shared ownership. RESOLVED:� That the proposed changes to the Housing Allocations Scheme be approved. The Head of Environment and Public Realm presented a report on the review of Waste Strategy 2014-2019. The Committee noted that the Council adopted its second 5 year waste strategic in 2014 with the objective to provide services which focussed on waste reduction, reuse and recycling.� The recycling rate was reviewed last year and was reduced from 60% to 55% by 2019. It was noted that over the past 12 months the recycling rate had increased to 49.9% from 47.79%.� However, despite the recent successes of various food waste collection campaigns including the �No Food Waste� stickers being placed on refuse bins, which had resulted in a 28% increase in the amount of food waste recycled, it was clear that the Council would not be able to achieve a 55% recycling rate by 2018/19 by engagement alone as it would require a substantial service change to achieve the targets as set out in the current Waste Strategy. The Head of Environment and Public Realm therefore proposed that a new Waste Strategy for 2018 � 2023 be prepared and presented to the Committee for approval by April 2018.� In order to achieve this it was recommended that a workshop be held in September/October which would be open to all Members (and be mandatory for Members of the Communities, Housing and Environment Committee). � An operative from Biffa be requested to attend the Workshop to give their perspective. � There was a problem of contaminated bins where residents or carers of those residents were not familiar with what goes in which bin.� A similar problem was evident where there were communal bins. The Waste Team would be working on a wider communications campaign to address the issue. ��������� Waste Strategy 2014-2019 be noted. 2.����� That the current Waste Strategy 2014-19 no longer delivers the Council�s ambition for its Waste and Recycling Services and that a new Waste Strategy for 2018-23 would be prepared and presented to the Committee by April 2018. 3.����� That a workshop be held in September/October for all Members and to be mandatory for the Communities, Housing and Environment Committee to shape the new Strategy and determine the level of ambition, investment and appetite for bold service changes. The Head of Environment and Public Realm presented a report on Waste Collection � Proposed New Charges. The Committee noted that in 2013 the Council entered into a partnership with Ashford and Swale Borough Councils and Kent County Council to let a 10 year waste collection contract, which was awarded to Biffa Municipal Ltd.� Every April an annual review was carried out to identify contract growth, which included changes in household numbers, garden waste subscriptions, bulky and clinical waste collections as well as a calculation of the annual indexation.� The annual indexation is calculated through a complex equation which included average weekly earnings index, CPI and DERV (Diesel). It was noted that over the past three years the annual indexation applied had been + 0.383%, - 1.184% and � 2.012% respectively and the number of properties increased by 2,500. For 2017/18 the indexation is +5.577% and when combined with property growth, will equate to an additional cost of �180,000 compared with the previous year. The Head of Environment and Public Realm advised that in order to close the gap between the original budget estimate and the uplifted contract costs, the current fees and charges had been reviewed. � Should the fee for the collection of 1 white good be �10 then the Council would be making a loss as the cost charged by Biffa was �15.50 which would equate to a �6,000 deficit per annum. � That the provision of bins for residents on a new development was paid for by the developers.� However, those residents moving into an existing property where the bins had been taken would have to pay for new bins. � The Council does have a statutory duty to collect clinical waste but could make a charge. � The Council does not provide the sharps bins, these are obtained by users from their doctor�s surgeries.� It was noted that the majority of residents already stockpiled them in readiness for a collection which was invariably twice a year. � A comparison was made with some Kent Authorities and whilst it was not known if flytipping had increased as a result of those charges, this could be explored further. 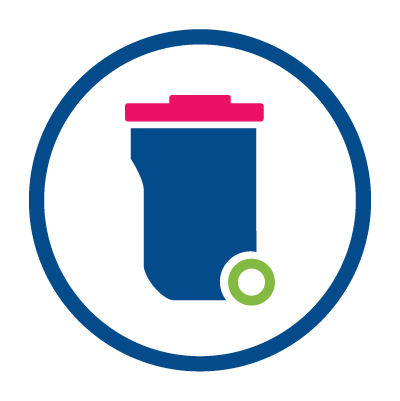 � The Council would be running a �know where your waste goes� campaign as part of the Litter Strategy. � The flytipping statistics would continue to be monitored and in particular fridges/freezers would be noted if part of any flytipping to be reported back to the Committee. Councillor Perry arrived at 7.15 p.m. during the discussion of this item. �������� Collection Service be introduced. 2.������ That the Subsided Bulky Charge be changed to offer those in receipt of Council Tax Reduction Benefit either one hazardous white goods item (Fridge/Freezer) or one 1-4 item collection per year. �������� for wheeled bins be withdrawn. �������� made for additional requests. ��������� carried out to determine its viability.